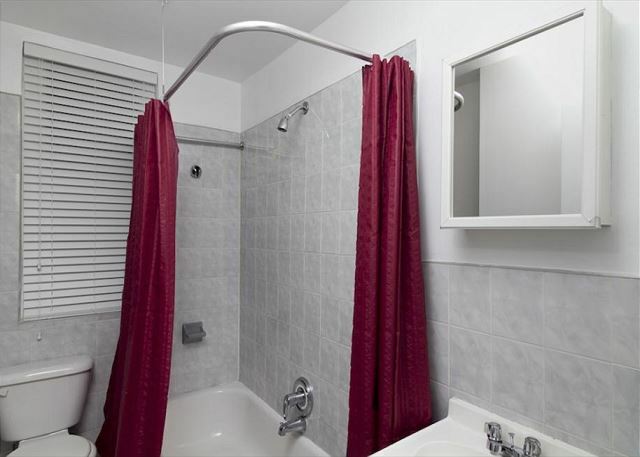 Midtown West one bedroom apartment in a desirable elevator building with a doorman can accommodate up to 4 adults. 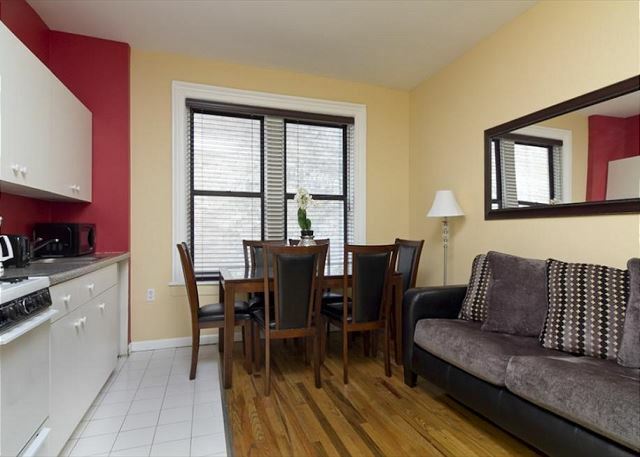 The apartment includes living room, dining area, and kitchen for a convenient stay with all the comforts of home. The living room features a plush L shaped sofa perfect for lounging and mingling with your companions while taking a break from the busy streets of New York City. 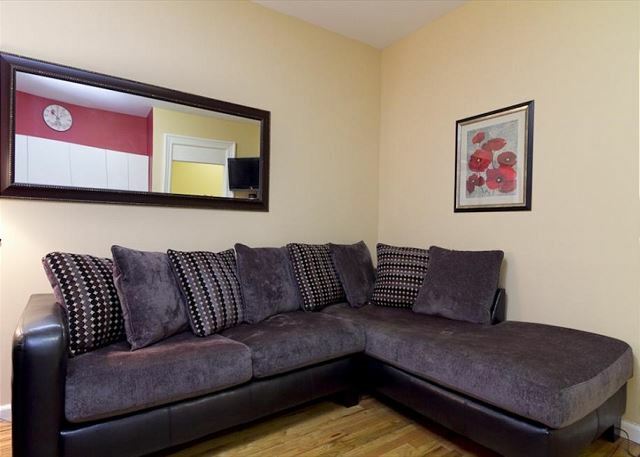 The sofa easily converts into a Full sized pull out bed to provide an extra sleeping accommodation. 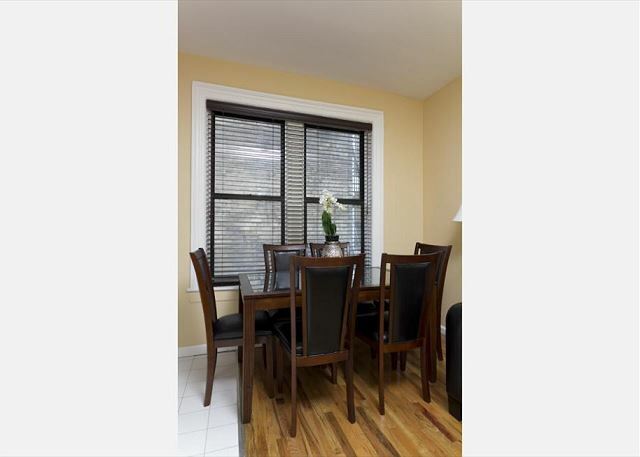 In the common area you will also find a dining table with seating for 6 for your dining enjoyment. 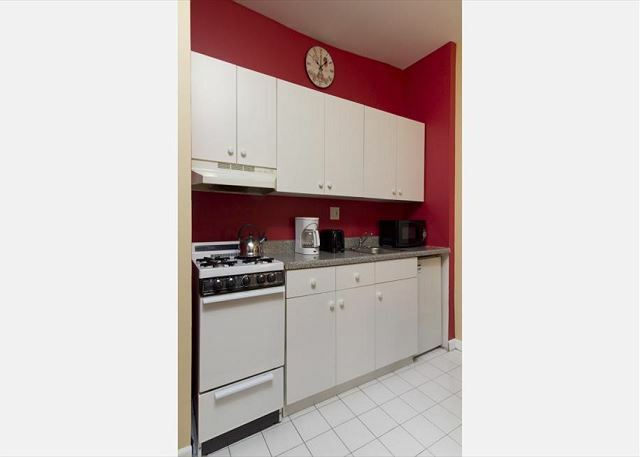 The fully equipped white cabinet kitchen includes appliances, dishware and cookware. 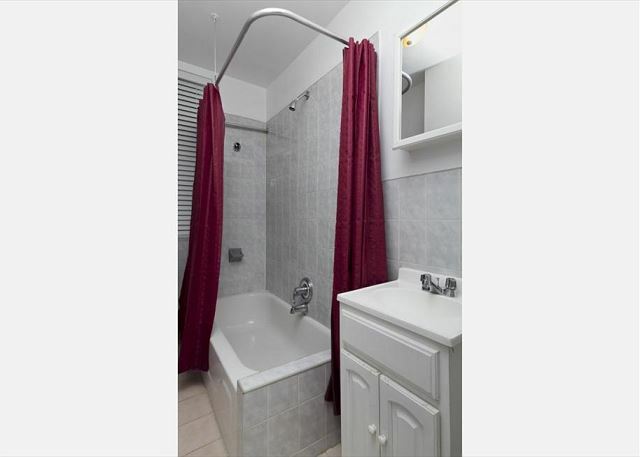 Full bathroom with shower, marble tub and towels provided. 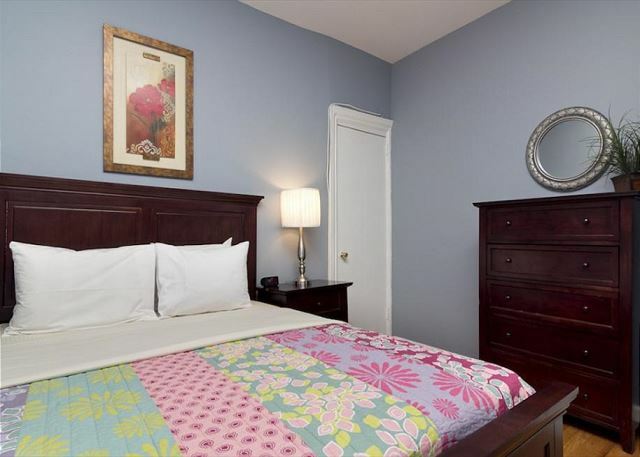 The bedroom features a Queen sized bed with matching nightstand and dresser for your belongings. There is also a Laundromat on the premises that is available for your use. 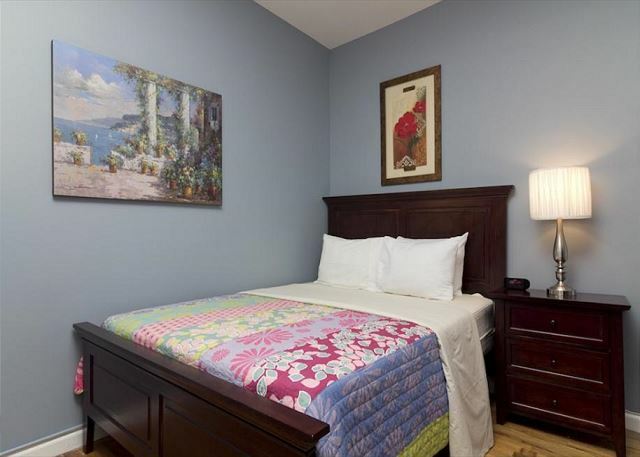 The building is located on 45th Street and 8th Avenue, meaning you’re a short walk away from the allure of the lights of Times Square that draws millions of tourist every year. 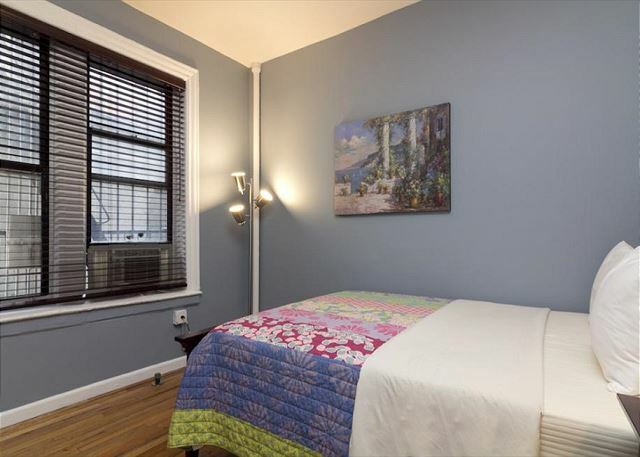 This is a great location since you are located in the middle of Manhattan making traveling throughout the city for sightseeing that much more convenient. Also, Times Square is conveniently a stop for various subway lines. 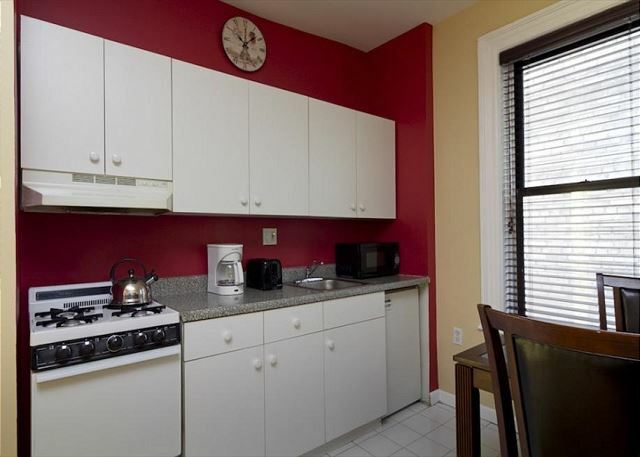 The area also offers a great selection of fine restaurants including those on Restaurant Row (West 46th Street) and 9th Avenue. There is also a wide selection of nightlife activities from Irish pubs, to piano bars, to comedy shows. New York is also the center of the arts world featuring a wide array of cultural institutions for the performing arts such as Alvin Ailey Dance Company and the various Broadways shows available. Visit Bryant Park for a laid back afternoon and social atmosphere. Here you can enjoy their free movie screenings in the summer or ice-skating in the winter. Rockefeller center is also a major attraction during the Christmas season with the Christmas tree and Christmas decorations. It will truly have you in the holiday spirit. 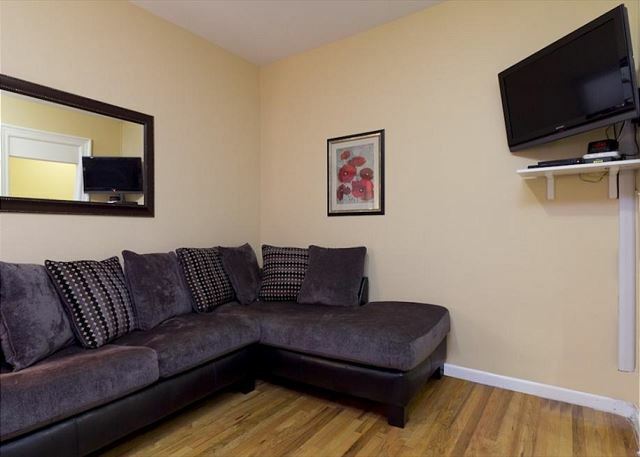 Make this your choice for a memorable New York City trip!